Mayor Rosalynn Bliss said the commission would confer with the city's human resource department and start an application process to fill the position. The commission also adopted the 2019 budget. Public comment centered on the rental application fee ordinance again. Tuesday night's lengthy City Commission meeting was a packed house. Some of the biggest news came at the end of the night when Mayor Rosalynn Bliss announced former Third Ward Commissioner James White was withdrawing his name from consideration from being appointed to David Allen’s now vacant chair. The mayor said the commission would confer with the city's human resource department and begin an application process to fill the position. The commissioners also adopted the $590 million budget for 2019. Other issues covered in the meeting were more public comment about the rental application fee ordinance and concerns about how a building near the Veteran’s home might be used by Sunshine Church. There was some disagreement on the process used to pick the city’s possible new contract for the water treatment facility with Davis Construction. Jim Connor from Trinagle Associates expressed concern that the City was not awarding the contract to the lowest bidder per the normal process, but to whom they liked. 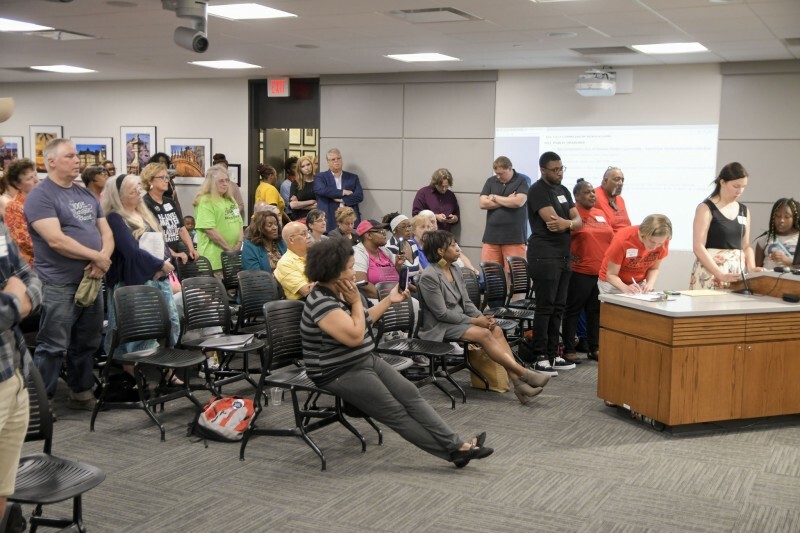 Commissioner David Allen echoed his concern about the process not being followed, while Commissioner Joe Jones expressed his confidence in city staff’s wisdom on who they picked. Commissioners postponed their vote on the issue until July 10, 2018 to clarify the process and decide which company should get the contract. Several people also got up to again talk about issues with rental applications fees. Clay Powell from Rental Property Owners Association said, “Seems like the real issue is not the cost of the fees, but understanding why someone [was] turned down," and said this was addressed in the ordinance. Community advocate Tabitha Williams said, “One thing is for sure, landlords guarantee to rent their property, but there is zero guarantee those seeking rentals will get that property. So taking that money, up to $100, and I'm representing low income, that's taking from other areas in their lives. It's already an invasion, landlords get information on renters, but we do not get any information on them. We don't get a background check on them. We don't get to know what the house even has in it. Some of these houses have lead and we're poisoning our children. So consider what fair housing really means." Members of Grand Rapids Homes for All read specific requests for the ordinance. Jolanda Howe from the organization asked supporters to stand and about 30 people stood during her and through Talor Musil's time as she continued reading the their statement. Jim Howe of Homes for All referenced the earlier conversations around process with the water project and said, “What is the process for this? How is there one seat at the table and it's filled by the Rental Property Owners Association? Why weren't their seats at the table for renters whom this ordinance is meant to protect?" Paul Rose, a resident of the Creston neighborhood pitched an idea like Car Fax where renters could get their background check once and have the info available for each succeeding landlord. Over 20 people spoke on this issue. Fifteen people commented on Sunshine Church using a building near the Veteran's Home as a church Suzanne Schulz reported, “The history around the zoning has been a little confusing which is why we thought a public hearing would be necessary." Church members talked about the good they would do there and bring to the community and veterans, while those opposed urged the buildling be used to serve the veterans. 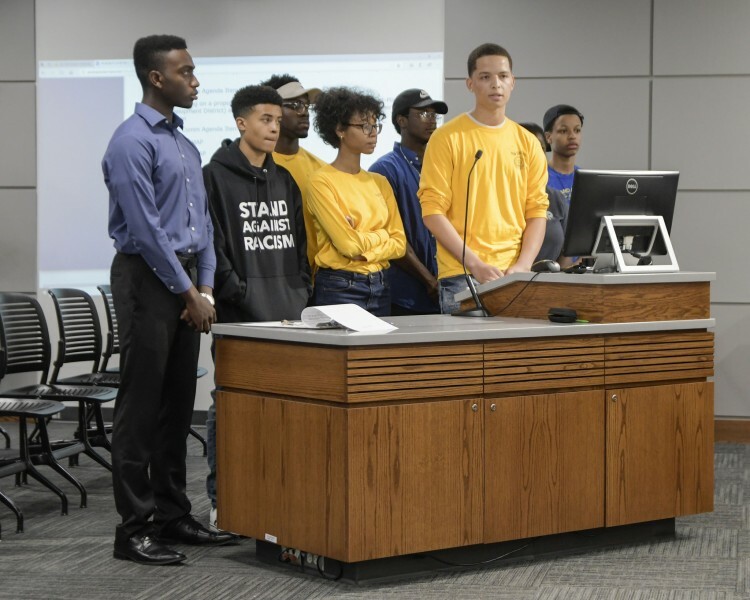 A group of nine teens from the NAACP Youth Council stood together, with Tavian Moore speaking. He said repeatedly that he was embarrassed by things happening in the City of Grand Rapids around policing and “We have received several complaints from black and brown youth in our city saying they have been harrassed for 'acting suspicious' in stores, being placed in handcuffs after being accused of breaking into their own vehicles, or stopped when walking home from work in the summer for fitting a description. 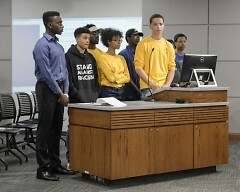 When I ask the youth council who they go to when these issues arise, hoping they would mention filing a complaint at the Internal Affairs unit or speaking up at the police meetings, they respond by saying, 'Well who are we supposed to go to when the people who are supposed to serve and protect us are targeting and harrassing us?'" During the final public comment period, more people spoke on the issue with rental application fees. 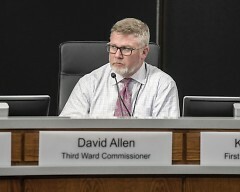 It was during the closing comments by commissioners at the end of the long meeting that Mayor Bliss announced former Third Ward Commissioner James White was withdrawing from the possibility of being appointed to David Allen’s now vacant seat. All the commissioners took time to thank David Allen for his service as Third Ward Commissioner at his last meeting. Allen, who said he’d take the opportunity to go out with a bang and said, “So I went on RPOA...on their website under government affairs, 'We need your support to kill these bills.' A bill they want killed is to require lead inspections at all regular rental inspections." He also said, "Their highest level of membership fee is $464 annually, no matter how many units you own, and for that fee you get unlimited background checks, criminal checks and credit reports. Unlimited. Which is $39 a month by the way. I think we're barking up the wrong tree having RPOA at the table." The June 12, 2018 city commission meeting can be viewed on the City’s Facebook page. The meeting agenda and minutes can be viewed on the City’s website.